The results sending email from admin@myemailserver.net to admin@myemailserver.net accepted. The good configuration, email server will asking password for admin@myemailserver.net. If use password and match, email can send to destination, if not use password, email server will deny. How if i’m trying to send fake mail and use my boss email and sending email to accountant and told for sending money to my card? if email server not improve with sender must login/anti fake mail, Zimbra will accept email from and to with same domain without authentication/password. How to improve Zimbra using sender must login/anti fake mail? The test above rejected with message not logged in. I am using Zimbra 8.6 and i couldnt find check_sender_access lmdb:/opt/zimbra/conf/ldap-restricrelay.cf that you showed up at the last step, Can you share the configuration of that file? which one the article did you mean? I found out where I went wrong.Thanks for your helping and responding as well. I have versión 8.5, I did just that but not working. i do all the steps multiple time but no effect , i also sure that my ip is not in trusted network . i am using zimbra 8.6.0. In the past I was using 8.0.7 with excepions managed into a file and everything was working fine. But now I do not know hot to manage it in 8.6. Could you please be so kind to make a short and simple step by step video or file ? I ran these commands, but it does not seem to have any effect. How can reverse these changes and do a fresh run. I tried zmprov mcf -zimbraMtaSmtpdSenderRestrictions but it did not work. And using telnet the smtp server allows me to use a fake “from” to send mails to the domain configured in zimbra. Are you testing telnet in Zimbra server directly? or from other server? Is it possible to create an exception for a specific domain? And now logging is not working for our zimbra server. I thought that command was related to the issue I’m having with not getting any logs and all of the services being in red status on the admin gui, but it seems like the sqlite db got erased somehow. Would you happen to know of a way to recreate it on zimbra 8.6? Unfortunately, that doesn’t fix the problem on my system. If I run zmsyslogsetup and zmloggerinit, a db folder gets created under the /op/zimbra/logger/ directory, but the logger.sqlitedb file has no tables in it. I believe my logs stopped working after I tried to remove the improvement in this thread using: zmprov mcf zimbraMtaSmtpdSenderLoginMaps proxy:ldap:/opt/zimbra/conf/ldap-slm.cf -zimbraMtaSmtpdSenderRestrictions. It could also just be a coincidence that the logs stopped working around the same time, I’m not sure what’s wrong. Hello thanks for the tutorial. When I use the telnet method, it’s rejected as you’ve showed. However, when I use the mail command and set the From field accordingly, the emails are sent!! What is the sure way to ensure that emails which have the same to/from fields are rejected by the server? Are you use that command from Zimbra itself? By the way, what OS is that you’re using? I’m test successful from your instruction. But I have 1 problem to discuss: When using thunderbird, I don’t change email address in account settings, beside that when I write new email, I choose customize From address and change to anything, the email send successful anyway. How can we prevent that? Do you know how to authorize a user so that it can send mail on behalf of all domain accounts ?. And not to have to be adding a line for every user. boss. buat zimbra 7 ada gak ?? IT IS NOT OK !!!!!! everything is fine but it is not working properly. Can you tested it on a new version of Zimbra 8.7.1 ? so will it work on 8.7 ? I checked the setting to version 8.7.0 on another production Zimbra and it is the same problem. A user who does not exist in domain can send mail. Today I checked your recommendations. yes I restart Zimbra (zmcontrol stop && zmcontrol start) and restart phisical machine without result. After the change works OK. Thank You, Iman, for so good public resource! Many articles are great and useful! After that telnet check was OK, but if an attacker has stolen password of only one user then he will be able to send messages with any value in the field FROM and Zimbra will display these fake DisplayName and fake address of the mailbox!!! Most likely this is a bug on the postfix side. Maybe someone have an idea how to fix this behavior?? I described in detail this situation on the zimbra forum (http://forums.zimbra.org/viewtopic.php?f=15&t=60813&sid=707f349619d3f3dc7e694f0d4f049079), but it unanswered yet.. I previously forbidden Relay connections, when try to send from not my domain I received “Relay access denied”. This is OK. In my case there a little different problem. 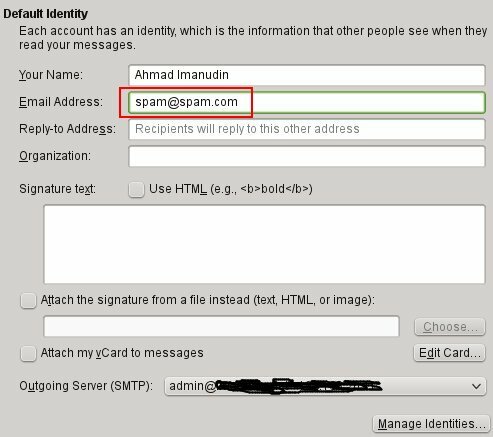 I can send a letter with FAKE mail address in field FROM through smtp on my Zimbra server, authenticated with another user on it.. But it doesn’t work correctly.. In zimbraMtaMyNetworks has values: 127.0.0.0/8 and public IP address of this server. Maybe I should delete public ip from there? I have followed your instruction in My Zimbra, but it didn’t work. Could you tell me, is there any wrong with my Zimbra ? could you please help me i’m using zimbra 8.0.7 free version. Please advice this above setup work with zimbra 8.0.7 free version ? Wheter this tips can run at Zimbra 8.7.1 ? Look like the script was running. How to solve this matter? Please make sure your email client use SSL or TLS 465/587 on smtp configuration. After i run the zmprov gs command, there is no ‘zimbraMtaSmtpdSenderRestrictions’ in my server’s list attributes. Is there any missing symbol ‘+’ before ‘zimbraMtaSmtpdSenderRestrictions’ in your script ? Or there is any mistake that i have ? is this work for centos 7 with zimbra 8.7.7? if not please guide me how to do it..
Hello iman, how are you? How can I do to revert this configuration on zimbra 8.7 (ubuntu16.04)? Hi, thank you very much, however I detected a problem. When I write a new mail, in this moment i can change the FROM address to “boss” and it works. how would you implement the rule “reject_sender_login_mismatch” using the web user interface for PolicyD Web Administration? I mean, do you have any hint on how to do that? do you mean that it hasn’t been done until now or that’s impossible? Okay, so you track SASLUsername instead of user@domain on the Web Administration Interface and, in doing so, you can implement a policy that rejects mails from user@domain in case the user didn’t login with his SASLUsername. It works. Very useful. Thanks a lot for sharing. Can you kindly write a tutorial on how to migrate zimbra in case we want to change server and need to keep all mails, contacts, passwords etc. ZeXtras Migration Tool is for export only and then have to use their paid tool for import. That is a bit problematic. Their selling price model is also not friendly. Cause seems like this is not working. Not sure where this “trusted network” can be configured. But I think I can send mail to anyone in the same subnet. Zimbra perhaps considers the same subnet as trusted? Can you suggest what I should do? This works in Zimbra 8.8.8? How to block mail if Return-Path: and From: are not same. I am using zimbra below version. Can you share the example return-path and from are not same? situasi 1 : user1@domain1.com harus login dan harus ada user user1 status berhasil. Sepertinya server saya tidak membatasi atau menguji domain yang valid ya. Release 8.8.9.GA.3019.UBUNTU16.64 UBUNTU16_64 FOSS edition, Patch 8.8.9_P4. using telnet the smtp server allows me to use a fake “from” to send mails to the domain configured in zimbra. Maybe someone have an idea how to fix this behavior? Thanks a lot… may problem solved by your guide… i need one more help.. how to restrict mail relay….. anyone can send mail by relaying may domain…. your help would be appreciated.